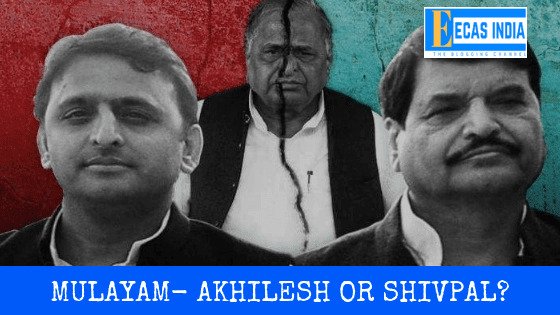 Lucknow, India: In the feud between Shivpal and Akhilesh, Mulayam will not be with Shivpal but with son Akhilesh. Such an indication he has given to everyone. When Shivpal Yadav rebelled from Akhilesh Yadav and formed 'Samajwadi Secular Front', he met Mulayam Singh, a close aide of Akhilesh Yadav, who told him that he wants to gather in every division of UP to strengthen the party, which is arranged to be done. During Akhilesh Yadav's tenure, Mulayam has been criticizing the government's work on all occasions. Many times he has also been speaking from public forums against Akhilesh. On November 25 last year, near ones of Mulayam Singh Yadav told the media that everyone should reach the office of Lohia Trust, why there would be a proposal to make a new party against Netaji Akhilesh Yadav. All the media of the country reached gathered and the entire OB vans were deployed. People started reaching and watched him declare that the son whom he gave his crown, how he would form a party against him. Meanwhile, Shivpal Yadav has removed all the marks of the Samajwadi Party from his Facebook page. Now he is said to be the leader of the socialist secular front. He is still the MLA, but the name of the party is not visible as of now. He has also unfurled the Samajwadi Party and Akhilesh Yadav on Twitter, but without the Mulayam, he does not have a great power. Then the question is, what will be the color of Shivpal's revolt in the Lok Sabha elections without Mulayam and especially when the coalition of the Samajwadi Party and the BSP has already been announced. Political experts say that in the Lok Sabha elections, Shivpal will not be able to do any major damage other than cutting some votes in Etawah, Ferozabad. Anyway, wealth is not enough to make a separate party, and neither does it have much power in this age.